Hibiscus herbal tea is more than just a delicious beverage. The health benefits of hibiscus tea are what make it so special. Hibiscus tea is made from the deep magenta sepals of the roselle flower, which is thought to be native to Africa. It is also known by its plant name Hibiscus sabdariffa—hence the name hibiscus tea. The hibiscus name also comes from the Greek word hibiskos, and it is a flowering plant from the mallow family. It is important to note that there are 232 species of hibiscus, and not all of them are used for tea or healing. For instance, the Hibiscus sabdariffa plant should not be confused with other hibiscus species such as the non-medicinal Hibiscus acetosella. The traditional hibiscus tea plant has yellow flowers and a red center. The Hibiscus acetosella has red flowers. 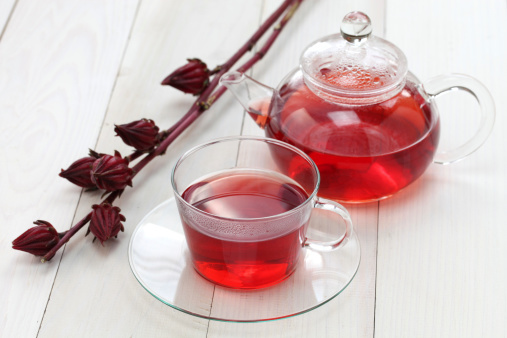 Like many other healthy teas, hibiscus tea is loaded with antioxidants. The ones you will find in hibiscus include zinc, vitamin A, vitamin C, and a number of bioflavonoids. Hibiscus antioxidants are mostly found in the anthocyanins of the plant, which are the natural pigments that give the flower its vibrant color. Antioxidants fight free radical damage to your cells due to frequent exposure to dangerous chemicals and a poor diet. Research also confirms the beneficial effect of the antioxidant content in hibiscus. One rat study from 2011 found that hibiscus extract increased the amount of antioxidant enzymes and lowered the harmful effects of free radicals by up to 92%. Another animal study, from 2009, showed that the leaves of the hibiscus have significant antioxidant properties such as polyphenols and flavonols. Scientific studies suggest that daily hibiscus tea consumption may benefit people with slightly increased blood pressure. In a six-week study published in the Journal of Nutrition, researchers discovered that hibiscus tea had a greater effect on lowering systolic blood pressure than the placebo, in 65 adults with mildly high blood pressure or pre-hypertension. Studies have also found that drinking hibiscus tea can lower blood pressure in type 2 diabetics. The antioxidant properties in hibiscus tea are also thought to benefit people with high cholesterol. Animal studies have found that hibiscus tea may lower total cholesterol and low-density lipoprotein (LDL) cholesterol, also known as the “bad” cholesterol. Other studies indicate that hibiscus tea may lower cholesterol levels in people with metabolic syndrome or diabetes. In one study published in the journal Phytomedicine in 2010, the researchers recommended hibiscus extracts to lower cholesterol and triglyceride levels in metabolic syndrome patients. A 2009 study published in the Journal of Alternative and Complementary Medicine found that doses of hibiscus tea twice a day for a month had significantly increased HDL cholesterol, and reduced LDL cholesterol, total cholesterol, and triglycerides in type 2 diabetes patients. A recent study from 2018, published in the Avicenna Journal of Phytomedicine, found that drinking hibiscus tea had significantly reduced total cholesterol and LDL cholesterol after 12 weeks. The cholesterol-lowering effect was thought to be due, in part, to the antioxidant anthocyanin content. In the aforementioned study published in the Journal of Alternative and Complementary Medicine in 2009, researchers found that hibiscus tea could significantly reduce LDL cholesterol and total cholesterol, and raise high-density lipoprotein (HDL) levels in 53 type 2 diabetics. Another study from 2009 found that daily hibiscus tea consumption could reduce blood pressure in type 2 diabetics. The antioxidant properties of hibiscus tea may also help treat liver disease. In a study published in the journal Food and Chemical Toxicology in 2000, researchers found that the anthocyanins in hibiscus tea could significantly reduce inflammatory liver lesions and oxidative liver damage in rats with toxic livers. Likely due to the antioxidant content in hibiscus tea, there is some research that supports hibiscus tea’s anti-cancer potential. The hibiscus protocatechuic acid found in hibiscus tea has strong antioxidant and anti-tumor properties. It is a metabolite of the polyphenols in hibiscus tea, which may also have potent anti-cancer abilities. In a study published in the journal Biochemical Pharmacology in 2000, researchers from the Department and Institute of Biochemistry at the Chung Shan Medical and Dental College in Taichung, Taiwan, suggested that the protocatechuic acid in hibiscus tea inhibits cancer cell growth by inducing cell death in human leukemia cells. Another study published in the journal Molecular Carcinogenesis in 2005 found that hibiscus extracts would also cause cell death when exposed to eight different kinds of gastric carcinoma cells. More research from 2016 shows that hibiscus extract impairs cell growth and reduces the invasiveness of plasma cell and mouth cancers. Hibiscus also has the potential to prevent the spreading of prostate cancer cells. Hibiscus tea health benefits also include calming the nervous system. This helps put people into a positive mind frame to reduce symptoms of depression and anxiety. In a study published in the Indian Journal of Pharmacology in 2012, researchers found that the flavonoids, anthocyanins, and anthocyanidins in hibiscus have potential antidepressant activity. Another study from 2012 found that other hibiscus species can help reduce depression in mice. Drinking hibiscus tea may also be a useful component of weight loss programs. Hibiscus tea is low in calories, and it is a diuretic herb that helps flush toxins and excess fluids from the body. In a 12-week study published in the journal Food & Function in 2014, researchers found that hibiscus extract consumption could reduce obesity and abdominal fat, and improve liver damage in obese individuals. Research published in the journal Medical Hypotheses in 2002 also suggests that hibiscus tea may be a natural weight loss alternative. Furthermore, a 2010 review suggests that herbal teas like hibiscus tea can help support weight loss by increasing the intake of fluids. Hibiscus tea is also considered a valuable digestive aid, and it is thought to improve bowel and bladder function. The diuretic properties of hibiscus tea will also help treat constipation and improve the strength of the gastrointestinal system. The high amount of vitamin C in hibiscus tea is considered a great immune system booster, and it can help prevent against colds and the flu. It has the ability to lower body temperature; therefore, hibiscus tea benefits may extend to people with a fever as well. The anti-inflammatory and antioxidant properties in hibiscus tea, such as vitamins C and A, can effectively treat acne, scars, sunburns, eczema, and skin allergies. As mentioned, hibiscus tea is an incredible source of antioxidants, which prevent free radical damage. An imbalance between the levels of oxidation and antioxidants in the body is what leads to oxidative stress, and conditions such as cancer, gene mutations, chronic fatigue syndrome, Alzheimer’s disease, Parkinson’s disease, atherosclerosis, heart failure, heart attacks, and more. One study published in the Journal of the Science of Food and Agriculture in 2012 discovered that hibiscus tea increased antioxidant load in the bloodstream and lowered the functionality of compounds that can contribute to oxidative stress and damage cells. The researchers suggested that the high number of polyphenols in hibiscus is what made the most impact in the study. Another study published in the Journal of Dietary Supplements in 2017 found that both hibiscus tea extract and green tea extract had beneficial effects on oxidative stress in male athletes due to a significant increase in total antioxidant capacity. For the study, 54 male soccer players had randomly received 450 mg daily of hibiscus tea extract, green tea extract, or the food additive maltodextrin. Hibiscus tea may also provide relief from cramps and menstrual pain. It is thought to be able to restore hormone balance, and therefore potentially lower the severity of menstruation symptoms like depression, mood swings, and overeating. Hibiscus tea is also used to satiate thirst and cool down the body. For this reason, it is popular among athletes and others with high-intensity training regimens. You’ll also find that people often consume iced hibiscus tea. It is worth noting that since hibiscus tea is a diuretic, it works to flush toxins and excess fluids from the body, and this may promote better performance in athletes. The antibacterial and antiviral properties of hibiscus tea allow it to fight conditions in which either bacteria or viruses are present. One in vitro study published in the Journal of the Science of Food and Agriculture in 2013 found that hibiscus tea extract inhibited the activity of E. coli (Escherichia coli), a bacteria strain that causes gas, cramping, and diarrhea. Another lab study from 2016 showed that hibiscus fought eight bacteria strains and was even effective against certain medication used to treat bacterial infections. A 2009 study also showed that hibiscus tea extract may have potential against MRSA (methicillin-resistant Staphylococcus aureus). Hibiscus tea extract’s antiviral effects were found to be effective in the prevention and treatment of various forms of influenza, including H5N1 highly pathogenic avian influenza viruses (HPAIVs) and low pathogenic AIVs (LPAIVs). The researchers concluded that the anthocyanin pigment may be responsible for hibiscus tea’s antiviral effect in the study. As noted, hibiscus tea is loaded with antioxidants such as vitamin A, vitamin C, and zinc. One 100-gram serving of hibiscus contains nearly a third of the vitamin C your body needs in a day. It is also packed with 85% of the vitamin B1 required daily, and almost half of the iron you need each day. Hibiscus tea is packed full of the essential fatty acids, omega-3 and omega-6. It is also a good source of dietary fiber, protein, vitamin B2, and copper. Hibiscus tea nutrition also features compounds such as malic acid, citric acid, and tartaric acid. The flavonoid glycosides and acidic polysaccharides in hibiscus tea help give it the deep magenta color. All the health benefits of hibiscus tea likely have you eager to try a cup for yourself. Here is a hibiscus tea recipe that you can make at home right now! You can also put it on ice if you find yourself in need of a cool drink during a hot day. Want to try something a little different? The following hibiscus tea recipe with ginger is iced, and it will also have you ready for any warm day in the sun on a back porch. Add four cups of water along with ginger and sugar (or honey) to a medium pot; bring to a boil at medium to high heat. Stir until the sugar, or honey, has dissolved. Next, remove from heat and add the dried organic hibiscus flowers. Then, cover and steep the hibiscus tea for 15 minutes. Pour the mixture into a fine sieve and into a bowl of ice water. Let it stand until cool and stir in the fresh lemon juice. Serve the hibiscus ginger tea over crushed ice with a lemon wedge garnish. Although it is loaded with health benefits, there are some minor hibiscus tea side effects to consider before drinking this antioxidant-rich beverage. It is also best to consult with your primary healthcare provider before using this herbal tea. Be sure not to combine hibiscus with Tylenol, or any other drug containing acetaminophen. The diuretic effect of the beverage may enhance the speed at which acetaminophen releases from the body. Hibiscus tea may also interact with the diuretic called hydrochlorothiazide. Hibiscus tea is also toxic for the liver in high doses. Another concern of hibiscus tea is the potential effect it has on pregnant women since it can induce menstruation. This may be helpful for women with irregular periods; however, it also means women drinking hibiscus tea may experience premature labor. It is also possible to have a hibiscus allergy as some people develop symptoms like hay fever; sinus problems; and itchy, red eyes. Others will feel intoxicated or experience hibiscus tea hallucinations. Hibiscus tea consumption is also not safe in people who take a medication for malaria called chloroquine. Since it also reduces blood pressure and blood sugar levels, people with diabetes or on antihypertensive drugs should monitor their blood pressure and blood sugar levels. Hibiscus tea is an excellent antioxidant-rich herbal tea that contains a number of health benefits. In this article, we detailed many of the benefits of hibiscus, including its effect on digestion, immune health, and skin health. At the same time, it may be able to treat high blood pressure, high cholesterol, diabetes, liver disease, cancer, depression, anxiety, menstrual pain, weight problems, and bacterial and viral infections. Like most supplements, it is important to purchase hibiscus extract, leaves, or powder from a trusted source. Some suggest purchasing hibiscus extract in an airless pump that hasn’t been exposed to air so you get the full effect of the hibiscus tea. Overall, hibiscus tea is delicious, especially when served with lemon juice and raw honey, or flavored with cinnamon, ginger, or nutmeg. Ajiboye, T.O., et al., “Antioxidant and drug detoxification potentials of Hibiscus sabdariffa anthocyanin extract,” Drug and Chemical Toxicology, April 2011; 34(2): 109-115, doi: 10.3109/0140545.2010.536767, last accessed April 5, 2018. Ochani, P.C., et al., “Antioxidant and antihyperlipidemix activity of Hibiscus sabdariffa Linn. Leaves and calyces extracts in rats,” Indian Journal of Experimental Biology, April 2009; 47(4): 276-282, PMID: 1938724, last accessed April 5, 2018. Gurrola-Diaz, C.M., et al., “Effects of Hibiscus sabdariifa extract powder and preventative treatment (diet) on the lipid profiles of patients with metabolic syndrome (MeSy),” Phytomedicine, June 2010; 17(7): 500-505, doi: 10.1016/j.phymed.2009.10.014, last accessed April 5, 2018. Mazaffari-Khosravi, H., et al., “Effects of sour tea (Hibiscus sabdariffa) on lipid profile and lipoproteins in patients with type II diabetes,” Journal of Alternative and Complementary Medicine, Aug. 2009; 15(8): 899-903, doi: 10.1089/acm.2008.0540, last accessed April 5, 2018. Hajifaraji, M., et al., “Effects of aqueous extracts of dried calyx of sour tea (Hibiscus sabdariffa L.) on polygenic dyslipidemia: A randomized clinical trial,” Avicenna Journal of Phytomedicine, Jan. to Feb. 2018; 8(1): 24-32, PMCID: PMC5787994, last accessed April 5, 2018. Frank, T., et al., “Consumption of Hibiscus sabdariffa L. aqueous extract and its impact on systemic antioxidant potential in healthy subjects,” Journal of the Science of Food and Agriculture, Aug. 2012; 92(10): 2207-2218, doi: 10.1002/jsfa.5615, last accessed April 5, 2018. Tseng, T.H., et al., “Induction of apoptosis by hibiscus protocatechuic acid in human leukemia cells via reduction of retinoblastoma (RB) phosphorylation and Bcl-2 expression,” Biochemical Pharmacology, Aug. 2000; 60(3): 307-315, PMID: 10856425, last accessed April 5, 2018. Lin, H.H., et al., “Hibiscus polyphenol-rich extract induces apoptosis in human gastric carcinoma cells via p53 phosphorylation and p38 MAPK/FasL cascade pathway,” Molecular Carcinogenesis, June 2005; 43(2): 86-99, doi: 10.1002/mc.20103, last accessed April 5, 2018. Malacrida, A., et al., “Antitumoral Effect of Hibiscus sabdariffa on Human Squamous Cell Carcinoma and Multiple Myeloma Cells,” Nutrition and Cancer, October 2016; 68(7): 1161-1170, doi: 10.1080/01635581.2016.1208830, last accessed April 5, 2018. Chun-Tang, C., et al., “Hibiscus sabdariffa Leaf Extract Inhibits Human Prostate Cancer Cell Invasion via Down-Regulation of Akt/NF-kB/MMP-9 Pathway,” Nutrients, July 2015; 7(7): 5065-5087, doi: 10.3390/nu7075065, last accessed April 5, 2018. Hadi, A., et al., “The Effect of Green Tea and Sour Tea (Hibiscus sabdariffa L.) Supplementation on Oxidative Stress and Muscle Damage in Athletes,” Journal of Dietary Supplements, May 2017; 14(3): 346-357, doi: 10.1080/19390211.2016.1237400, last accessed April 6, 2018. Jung, E., et al., “Physicochemical properties and antimicrobial activity of Roselle (Hibiscus sabdariffa L.),” Journal of the Science of Food and Agriculture, Dec. 2013; 93(15): 3769-3776, doi: 10.1002/jsfa.6256, last accessed April 6, 2018. Abdallah, E.M., “Antibacterial efficiency of the Sudanese Roselle (Hibiscus sabdariffa L.), a famous beverage from Sudanese folk medicine,” Journal of Intercultural Ethnopharmacology, March 2016; 5(2): 186-190, doi: 10.5455/jice.20160320022623, last accessed April 6, 2018. Arullappan, S., et al., “Preliminary Screening of Antibacterial Activity Using Crude Extracts of Hibiscus rosa sinensis,” Tropical Life Sciences Research, Dec. 2009; 20(2): 109-118, PMID: 24575183, last accessed April 6, 2018. Baatartsogt, T., et al., “High antiviral effects of hibiscus tea extract on the H5 subtypes of low and highly pathogenic avian influenza viruses,” Journal of Veterinary Medical Sciences, Oct. 1, 2016; 78(9): 1405-1411, doi: 10.1292/jvms.16-0124, last accessed April 6, 2018.